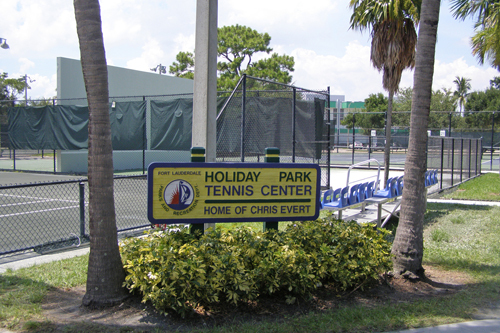 I spent a warm, humid day (which I've seen a lot of this summer back home in Champaign) at the Holiday Park (aka Jimmy Evert) Tennis Center in Fort Lauderdale. The Boys' 14 singles were started very early in the morning to make up for some lost time due to weather problems, so I just came at the end, but I did get to see some of the consolation and doubles at this event. For the first time, the USTA National 14 Clay Court Championship are being run with compass draws. This presents advantages and disadvantages, unfortunately more of the latter in its first time out. While the players are guaranteed more matches, many are confused about when they are playing and what draw they are in. There is also a limit to the consolation since the same group (i.e. everyone who lost in the 1st round) stays together. To my advantage, it did put a lot more on the court than would have been this far in the tournament. 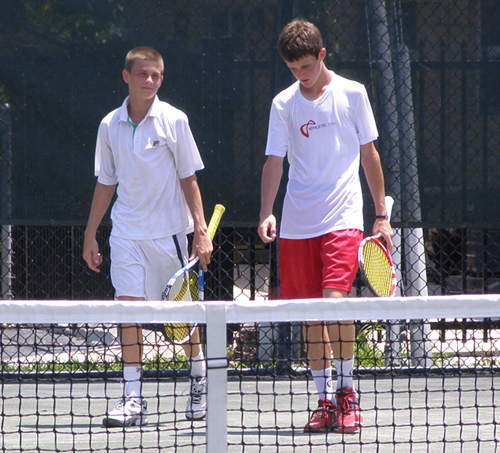 One of the players I had the opportunity to watch was New Yorker Brendan Volk (left). 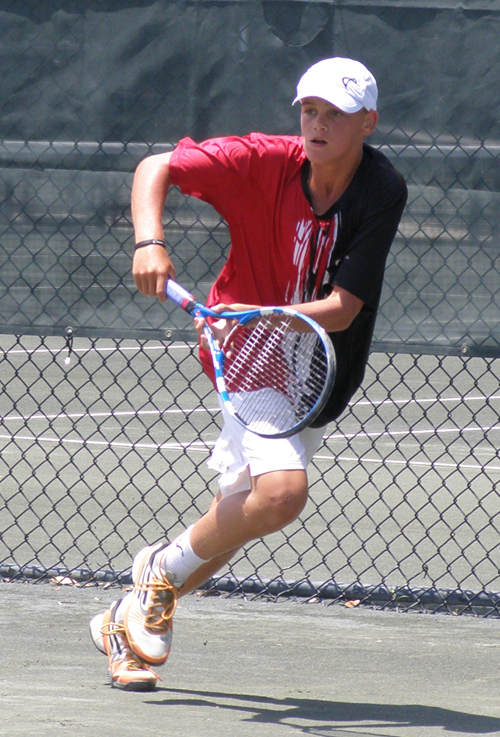 Brendan had taken out second-seeded Robert Seby in the first round of this tournament. He advanced two more rounds before falling to No. 17 Jake Devine and then won two more in the Northeast draw. All those matches seemed to take their toll and by the time the talented teen got to the second set against Charlie Adams, his great run was over. I also got to see a bit of the Northwest final between Alexander del Corral and Johnathan Small, which was closer than the 6-3,6-1 win by Small (below) demonstrates. The semifinals are set in the main draw at this tournament and though three of the four top seeds are gone, all the remaining players are seeded and had hard fought quarterfinals to get to this point. For the semis, Cameron Klinger (8) will be facing Francis Tiafoe (4) and Reilly Opelka, who upset Cameron's doubles partner and the No. 3 singles seed Tommy Paul, 6-4,7-5, will face Catalin Mateas (12). I had the chance to watch some of the top seeded doubles team of Cameron Klinger and Tommy Paul (below) squeeze by Michael Genender and James Wasserman (9) in a long, competitive match that finally ended in favor of the higher seeds, giving Cameron a chance to sweep this tournament. I will be back in Fort Lauderdale on Friday to watch all of the singles and doubles finals in the main draw. My first stop on Thursday will be at the Polo Club in Boca Raton for the semifinals of the Girls' 12s. Then it's off to Delray Beach for the quarterfinals of the Boys' 18. If the timing works, I may even be able to sneak some Boys' 16s in there!